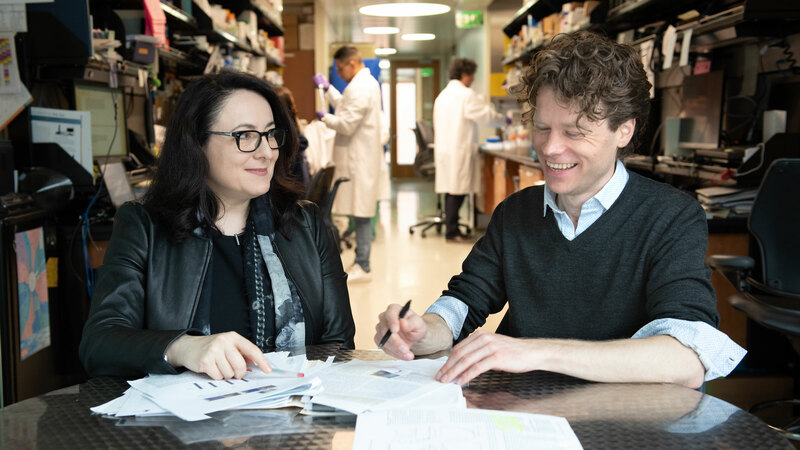 Gladstone scientists Katerina Akassoglou (left) and Mario Merlini (right) found that a blood protein destroys memory storage sites in the brain and may lead to new treatments. Brain from patient with Alzheimer's disease with fibrinogen (red) and tortuous blood vessels (green). Other authors include Victoria A. Rafalski, Pamela E. Rios Coronado, T. Michael Gill, Maya Ellisman, Gayathri Muthukumar, Keshav S. Subramanian, Jae Kyu Ryu, Catriona A. Syme, and Dimitrios Davalos from Gladstone, as well as William W. Seeley from UCSF, and Robert B. Nelson from Lundbeck Research USA. The work was supported by the National Institute of Neurological Disorders and Stroke, the Swiss National Science Foundation, the Race to Erase MS, the American Heart Association, the Ray and Dagmar Dolby Family Fund, H. Lundbeck A/S, and the Conrad N. Hilton Foundation.